When Francois Robert unexpectedly acquired a human skeleton in the 1990s, he knew he had to do something wonderful with it. 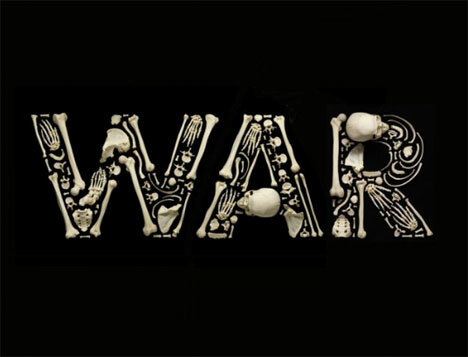 Several years later when the economy collapsed and he found himself with time on his hands, Robert finally settled on a project: powerful anti-war images spelled out in human bones. Bones, whether animal or human, always evoke powerful emotions. They represent death, loss, destruction, a sense of sad history. Francois Robert is no stranger to these images and emotions: he once spent five weeks photographing 140 animal skulls from the Field museum of Natural History. 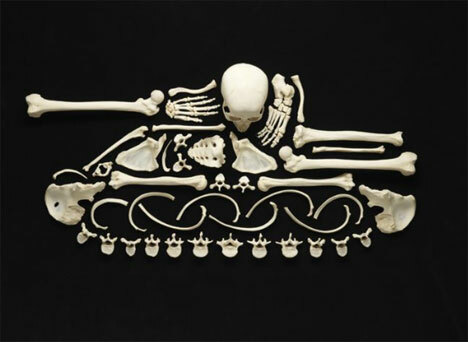 He’s always been fascinated by bones, so it’s no surprise that he spent all of 2008 rearranging them into evocative sculptures. 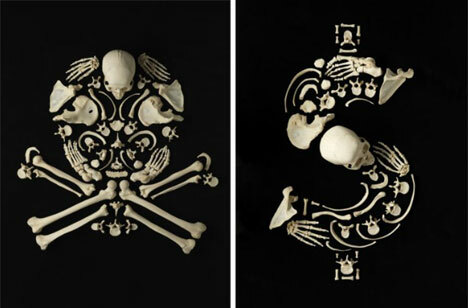 The project started when the photographer found an old educational skeleton in a locker purchased at a school auction. He displayed it in his studio for years but always wondered what else he could do with it. 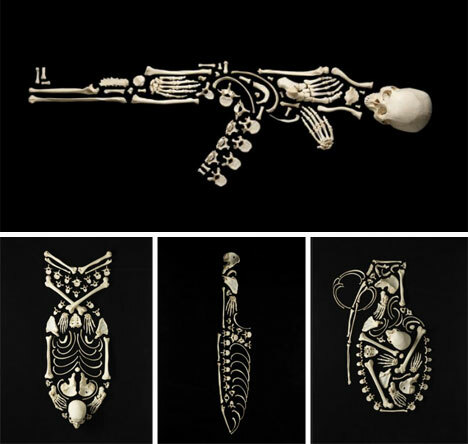 He eventually came up with the idea to take the skeleton apart and use the bones to create these unique and hauntingly beautiful works of art. 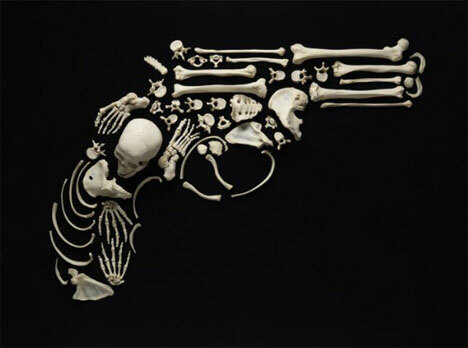 The series of photographs is entitled “Stop the Violence,” and it uses human bones as a reminder of the consequences of violence. Each sculpture is five to six feet wide and took Robert a full day to assemble. The images are all grippingly powerful: weapons, religious symbols and words that bring to mind the destruction that is left behind after war. Many of us are shocked at the simple sight of human bones. The built-in emotional factor of the bones is only amplified by Robert’s arrangements. But the artist is always careful to maintain a sense of respect for the bones; this human on the floor of his studio is a very real reminder of what is left behind when a light is extinguished.